BACKGROUND AND PURPOSE: Both adhesive and nonabrasive embolic agents are available for arteriovenous malformation (AVM) embolization. The purpose of this study was to evaluate a novel ethanol-based nonadhesive liquid embolic material in a swine AVM model. MATERIALS AND METHODS: Eudragit (copolymer of methyl and butyl methacrylate and dimethylaminoethyl methacrylate) was dissolved in 50% ethanol and 50% iopamidol. Eudragit was injected into 9 retia mirabilia (RMs). Ethanol and iopamidol mixture were injected into 4 RMs for comparison. Three RMs embolized with Eudragit mixture were evaluated both angiographically and histopathologically acutely (3–24 hours) and at 30 days and 90 days after embolization. RESULTS: No procedural complications from Eudragrit embolization were noted, including retention or adhesion of the microcatheter. Various degrees of inflammation were observed in the acute and 30-day specimens. Two RMs showed partial recanalization on both histopathology and follow-up angiography in the 30-day group. Arterial fibrosis and calcification were observed in the 30- and 90-day specimens. The internal elastic lamina was disrupted in the 30- and 90-day specimens, but there was no evidence of Eudragit extravasation or hemorrhage. Endothelial damage was seen in all specimens and was particularly severe in the 30- and 90-day specimens. CONCLUSION: Eudragit polymer induced inflammation in thrombosis similar to n-butyl 2-cyanoacrylate, but without the disadvantages of perivascular hemorrhage and extravasation of embolization material. Although recanalization of some embolized RMs was noted, further investigation into Eudragit as a potentially useful embolic material for brain AVMs is warranted. Endovascular embolization of brain arteriovenous malformations (AVMs) is a widely used treatment option. 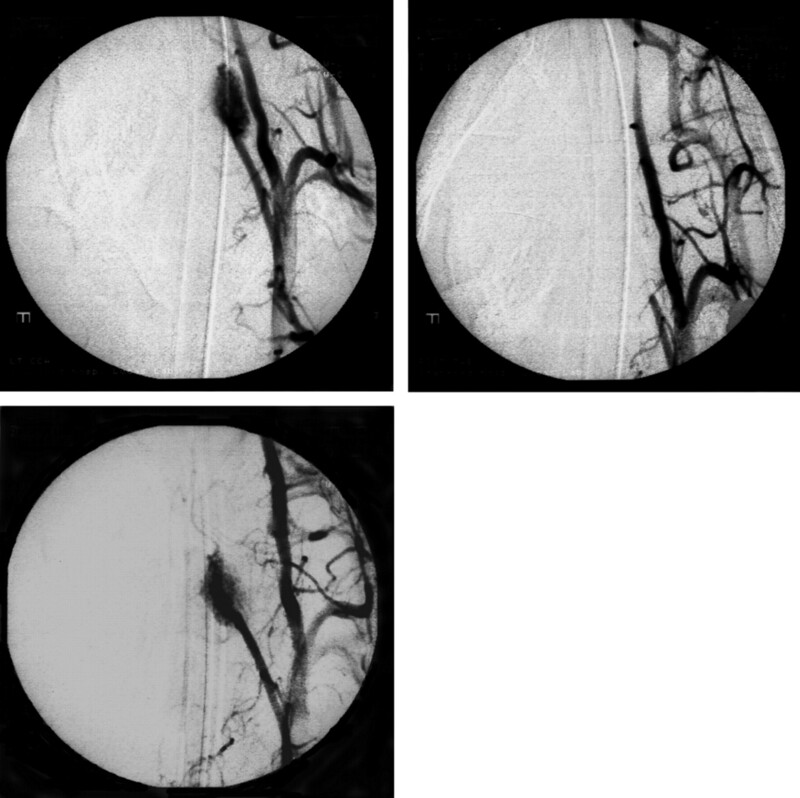 The goal of embolization is the safe and effective occlusion of portions of AVM nidus. A liquid embolic agent, n-butyl 2-cyanoacrylate (n-BCA), is the most commonly used AVM embolic agent. However this agent has inherent adhesiveness and requires skilled handling and injection to avoid adherence of the catheter to the vessel wall. Therefore, several nonadhesive embolic materials have been evaluated to overcome this disadvantage.1–10 A mixture of ethylene-vinyl alcohol copolymer (EVOH) and dimethyl-sulfoxide (DMSO) (Onyx, ev3, Irvine, Calif) is the only commercially available nonadhesive liquid embolic material. Eudragit mixture is an alternative nonadhesive liquid material developed by Yamashita et al in 1996.5 This mixture, Eudragit-E 100 (Röhm America, Piscataway, NJ), consists of copolymer of methyl and butyl methacrylate and dimethylaminoethyl methacrylate, 50% ethanol as a solvent, and contrast medium. In animal studies, its effectiveness and safety were reported by recent publications.5,11,12 However, to our knowledge, it has not been assessed in a model that more closely duplicates the clinical setting in which it would be used. The swine rete has been widely used for the assessment of embolic materials because it is an ideally suited model for the human AVM.1,10,13 The purpose of this study was to evaluate the ease of handling, tissue response, and the ability to achieve vascular occlusion with Eudragit as an embolic agent. Eudragit-E 100 is a cationic copolymer that is supplied as off-white granules. This copolymer consists of butyl methacrylate, dimethylaminoethyl methacrylate and methyl methacrylate in the ratio of 1:2:1. Eudragit was originally used as a coating for orally administered tablets. This coating is degraded in the stomach by normal gastric acids. Yamashita et al5 first used this polymer as a liquid embolic material by mixing it with a contrast medium and ethanol as an organic solvent. When injected into a vessel, the ethanol diffuses immediately, causing the polymer to precipitate as a solid. To create the embolic mixture, we dissolved 1 g of Eudragit-E 100 in 5 mL of absolute ethanol and 5 mL of iopamidol (Isovue 370, Bracco Diagnostics, Princeton, NJ) at room temperature to make 10 mL of a 10% Eudragit mixture. A mixing time of 18 hours is required to obtain a homogeneous mixture. This mixture is filtered through a microfilter with a pore diameter of 0.22 μm and poured into sterile vials that are crimped to avoid evaporation of ethanol during sterilization and storage. It is autoclaved at 121°C and 3 atm for 20 minutes. Specific pathogen-free Yorkshire pigs weighing 30–40 kg were obtained from a local vendor. A total of 9 Yorkshire swine were used in this study. All animals received humane care, and all procedures were approved by the Stanford University Administrative Panel on Laboratory Animal Care. Swine have paired retia mirabilia (RMs) at the skull base within the cavernous sinuses. Each rete is located between the ascending pharyngeal artery, which is a branch of the common carotid artery, and the internal carotid artery. The right and left retia communicate across the midline. The rete itself is a tiny vascular mesh that structurally resembles the nidus of the human cerebral AVM. Three animals were euthanized at an acute stage (immediately, 6 hours, and 1 day after the procedure), 3 survived for 30 days, and 3 survived for 90 days after embolization. All swine fasted overnight and were premedicated with tiletamine and zolazepam (Telazol). General anesthesia was induced with isoflurane by mask and maintained with isoflurane via endotracheal intubation. The routine procedures were performed under sterile conditions to avoid complications due to infection. With a 20-gauge access needle, we placed a 6F sheath in the right common femoral artery. A 6F guiding catheter, flushed continuously with heparinized saline, was placed into the right or left common carotid artery under fluoroscopy. Control angiography was performed followed by navigation of a microcatheter (Prowler Plus or Prowler 14, Cordis Neurovascular, Miami Lakes, Fla). The microcatheter was first navigated into the proximal rete in a wedged position, then pulled back 2–5 mm until the whole rete (not part of the rete) was opacified with the contrast injection. The microcatheter was placed just proximal to the entrance of the rete to prevent reflux of Eudragit material into the proximal ascending pharyngeal artery. With this position, it did not arrest the flow into the rete, and blood flow around microcatheter was observed. Nine RMs were embolized with Eudragit. Before Eudragit embolization, 50% ethanol was used to fill the space of the microcatheter. Ethanol was injected slowly to avoid migration into the cerebral vasculature. Eudragit embolization was performed with 1.0-mL luer lock syringes by using 0.4–0.5 mL of the solution to complete embolization. An injection rate of 0.02 mL/s or slower was used. In some animals, the mixture remaining in the microcatheter was pushed with 50% ethanol (“sandwich” technique14). Obliteration of the proximal part of the rete was attempted to minimize a risk of stroke. A mixture of 50% ethanol and 50% iopamidol was injected into 4 retia for comparison purposes (Table 1). For the ethanol/iopamidol mixture, 0.4 mL was injected at the same rate as the Eudragit mixture. Obliteration was confirmed with angiography at the end of each embolization procedure. All animals were followed up at the animal facility, and neurologic assessment was performed regularly. Pre- and postembolization angiography was performed to assess vascular obliteration and vasospasm. We also performed follow-up angiography with the animal under general anesthesia just before euthanasia to check for evidence of recanalization within the embolized retia on all swine assessed beyond the acute time points. All retia were harvested for histologic examination. Tissues were fixed in 10% neutral buffered formalin, processed into paraffin, sectioned at 5 μm, and stained with hematoxylin-eosin (H&E) and elastica-van Gieson. Because Eudragit-E 100 is soluble in ethanol, some of the embolized polymer was dissolved during processing. However, because our purpose was to assess tissue response against this mixture, this technique proved suitable for our study. Immunohistochemical staining was performed for CD31 by using the Tyramide Signal Intensity Amplification biotin system (PerkinElmer, Boston, Mass) to observe the endothelium of affected vessels. All specimens were examined by a veterinary pathologist (C.R.D.). Complete closure of the proximal portions of the retia was observed in all Eudragit embolizations. 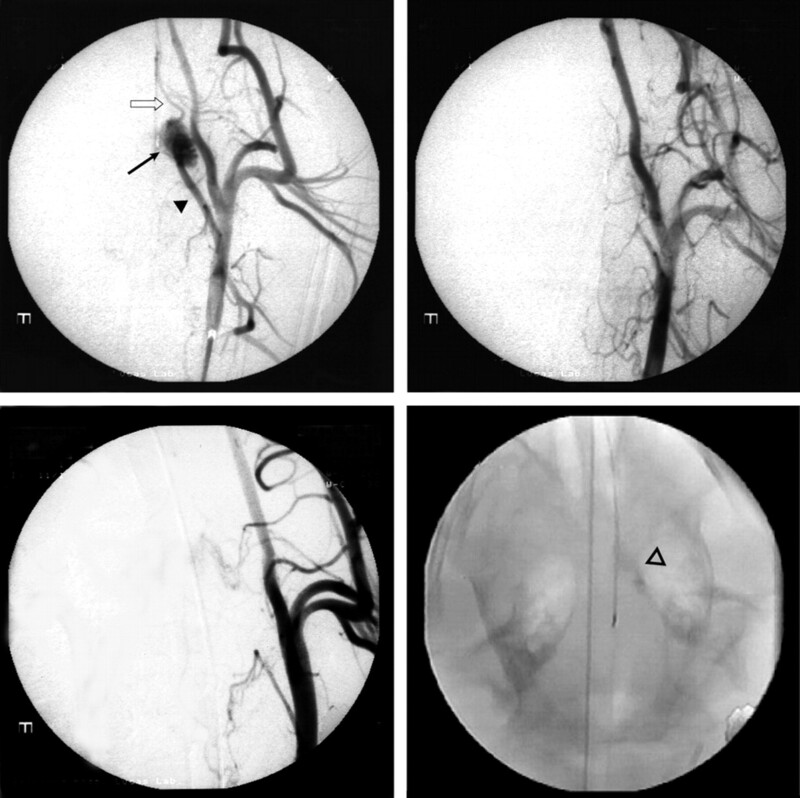 The Eudragit mixture was visualized under fluoroscopy during embolization, and behavior of the material could be monitored for the entire procedure. No technical problems were experienced with embolizations in this study (Fig 1). Despite very slow injections through 1 microcatheter, no occlusions of the microcatheter were seen. Withdrawal of the microcatheter after embolization was also accomplished without difficulty. There were no clinical complications such as strokes, cardiopulmonary failure, or infection during the follow-up period in the 30-day and 90-day survival groups. Anteroposterior view of the angiograms of swine retia injected with Eudragit mixture (pig 8). Left upper, Control angiogram before embolization shows the rete (arrow). Each rete is located between the ascending pharyngeal artery (arrowhead) and the internal carotid artery (white arrow). Right upper, Immediately after embolization of the rete with Eudragit mixture. Left lower, Angiogram 3 months after the embolization with Eudragit mixture shows complete obliteration of left rete. Right lower, Embolized Eudragit can be seen as radiopaque cast on the nonsubtracted image (white arrowhead). There was no recanalization of flow within the embolized RMs on angiography immediately after Eudragit embolization. The distal part of the rete, which we did not attempt to embolize, was visualized due to vascular input from small branches of the ipsilateral external carotid artery or from the contralateral rete via the inter-retial communication. Vasospasm was not detected in the retia injected with ethanol. Recanalization in 2 of 3 embolized retia in animals that survived for 30 days was seen (Fig 2). No embolized retia showed recanalization in the 90-day survival group. Anteroposterior view of the angiograms shows recanalization 1 month after embolization with Eudragit mixture (pig 4). Left upper, Before embolization. Right upper, Immediately after embolization of the rete with Eudragit mixture. Lower, One month after embolization. The rete shows complete recanalization. Histologic results for the retia injected with Eudragit mixture are summarized in Table 2, and results for retia injected with ethanol/iopamidol mixture are summarized in Table 1. 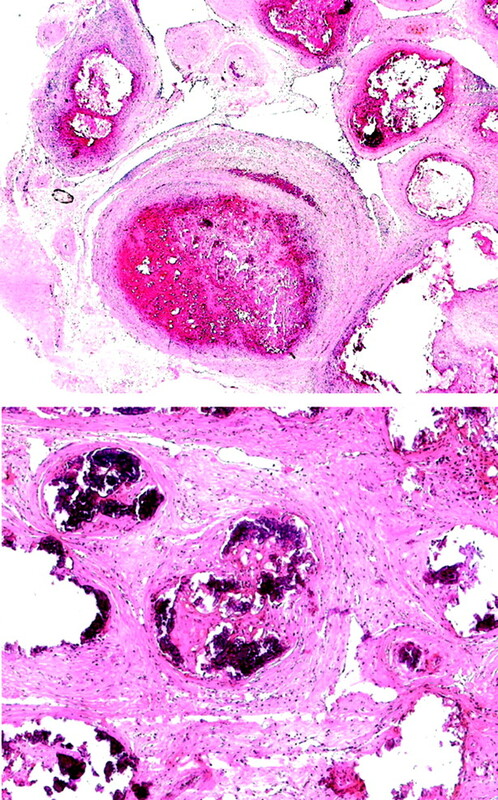 Embolized Eudragit mixture appeared as an amorphous eosinophilic intravascular material (Fig 3). Eudragit material was frequently mixed with erythrocytes, attached to the intima of dilated vessels, and accompanied by thrombus. One acute specimen showed severe angionecrosis, but no vessel rupture or extravasation of the Eudragit polymer was observed. Inflammation was seen in vessel walls as well as in the vascular adventitia. In acute specimens, inflammation consisted mainly of neutrophils with fewer mononuclear cells. At 30 days, specimens demonstrated numerous macrophages, lymphocytes, and foreign-body giant cells, with some degree of calcification. At 90 days, fibrosis of affected vessel walls was seen (Fig 4). Some retia demonstrated subendothelial hemorrhage in areas where the endothelium had peeled away from the internal elastic membrane. Elastica-van Gieson staining revealed disruption of the internal elastic membrane in the affected vessel walls. This finding was not observed in specimens harvested earlier than 12 hours after injection. Histopathology of retia obtained at acute stages after embolization with 10% Eudragit mixture. 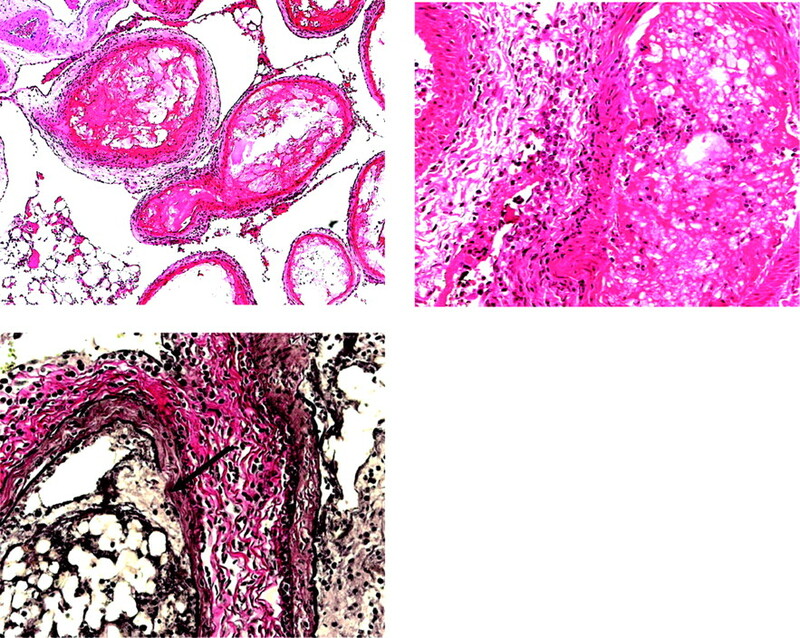 Upper left, Embolized Eudragit polymer appears as intraluminal eosinophilic material accompanied by a thrombus. Empty spaces are shrinkage artifact due to processing. Upper right, Neutrophils and mononuclear cells infiltrate the vessel wall and adventitia. Lower, The internal elastic membrane is partially disrupted (arrow). Upper left, H&E, original magnification ×100. Upper right, H&E, original magnification ×400. Lower, Elastica-van Gieson, original magnification ×400. Chronic response of vessels embolized with Eudragit mixture. Upper, One month after embolization. Arteritis and endarteritis consisting of lymphocytes, plasma cells, and macrophages. Lower, Three months after embolization. Embolized arteries show necrosis, loss of normal profiles, calcification, and fibrosis. Upper, H&E, original magnification ×100. Lower, H&E, original magnification ×100. We observed histologic changes consistent with recanalization in the 2 retia showing antemortem angiographic evidence of recanalization. One rete demonstrated numerous small vessels within the organized part of the embolized artery. We also found a patent lumen lined by endothelium adjacent to encapsulated material within 1 embolized artery (Fig 5). Photomicrographs of recanalized retia after embolization with Eudragit mixture. Left, (pig 4) Note the patent lumen containing several erythrocytes (thin arrow) and the embolized lumen (thick arrow), both in the same embolized artery. The empty spaces in the embolized lumen are due to dissolution of the polymer during processing. This change may represent a step in recanalization. The patent lumen may be sequestered from the embolized vessel. Right, (pig 6) Small patent vessels are present within the embolus. This finding is also noted with n-BCA embolization. Left, H&E, original magnification ×400. Right, H&E, original magnification ×100. Immunohistochemical assessment for CD31 revealed endothelial damage ranging from mild peeling away from the internal elastic lamina to complete disappearance of the endothelium. Mural hemorrhages between the detached endothelial layer and the internal elastic membrane were also confirmed with this staining. We did not observe inflammation or disruption of the internal elastic membrane in vessels injected with ethanol/iopamidol mixture and examined immediately and 90 days after injection. Peeling away of the endothelial layer was, however, demonstrated by CD31 staining. The intensity of this change was less than that in the Eudragit-injected arteries. A nonadhesive liquid embolic agent should demonstrate relative ease of injection and have little or no risk of catheter adhesion when compared with adhesive agents such as n-BCA. In this study, we did not experience any catheter adherence or obstruction of the microcatheter during the injection. Our mixture did require very slow injection to prevent any adverse effect of ethanol on vessels and the inadvertent embolization of cerebral vessels. Slow and controlled injection, however, is easily tolerated due to the cohesive but nonadhesive nature of Eudragit. This slow injection technique is not feasible with adhesive embolic agents. One important concern for any embolic material is compatibility with endovascular devices. We did not experience problems with damage or dissolution of the microcatheters used for Eudragit embolization in this study. Because both Eudragit polymer and ethanol are not inherently radiopaque, 50% iopamidol (370 mg/mL) is added to these mixtures to render them visible under fluoroscopy. This modification allows safe monitoring of the Eudragit mixture injection under road-mapping fluoroscopy. Radiopacity of the cast of the precipitated Eudragit mixture is not permanent; the mixture would lose attenuation as the contrast medium diffuses out of the precipitated cast. Thus, even though the embolized casts were radiopaque at the end of each embolization procedure, this radiopaque cast could not be detected at the follow-up angiography. This loss of visibility is distinct and separate from the issue of recanalization following embolization. We found that all embolized retia Eudragit casts lose their radiopacity on follow-up imaging whether or not recanalization has occurred. This observation suggests that iopamidol may not bind strongly enough to Eudragrit for a long period of time. Eudragit mixture has been used clinically in some medical institutions in Japan. According to our personal communication with Shigeki Kobayashi, who has used Eudragit for several years, he does not report lack of radiopacity during embolization procedures as a problem; that is, this preparation of Eudragit was found to be safe and adequate for use in limited clinical settings. Although posttreatment CT was not performed, the embolized Eudragit would potentially be more easily detected and visible by using CT. Further radiopacity could potentially be achieved with the addition of tantalum powder as used in many polymeric preparations. These issues will be addressed with further investigation by our group. Two retia in this study demonstrated evidence of recanalization. In general, recanalization of the embolized nidus may occur when the embolic material degrades and disperses or when nonembolized vessels are recruited. Fournier et al16 separated these 2 mechanisms of recanalization, calling the former “revascularization” and the latter “collateralization.” An alternative mechanism of recanalization may occur if there is incomplete embolization due to vasospasm associated with rapid injection of alcohol-based agents.3 Although vasospasm was a possible factor in these retia that recanalized, we observed no vasospasm in our control animals injected at the same rate with ethanol/iopamidol mixtures. For this reason, we believe that vasospasm was not a likely cause of the observed recanalization. However, we could not identify the mechanism of recanalization with angiography. We did find histologic evidence of recanalization in the 2 retia that also showed angiographic evidence of recanalization. One finding was similar to that described by Brothers et al,13 wherein new vessels had developed within the unstable organized embolus. This kind of vascular organization within an embolized artery was only seen in the retia with angiographic evidence of recanalization. Another histologic observation in the retia showing recanalization identified patent lumen lined by endothelium immediately adjacent to, and impinged by, a focus of encapsulated embolized material surrounded by fibrous tissue and variable inflammation (Fig 5). Vinters et al17 described a similar histologic change in AVMs embolized with bucrylate and speculated that this occurred when the injected material was transferred to the extravascular space and appeared as an encapsulated nodule immediately outside the vessel. They speculated that this process commenced with angionecrosis followed by covering of the embolus with endothelium and proliferation of smooth muscle cells between the embolus and the vessel lumen, which would allow the material to pass into the extravascular space. On the basis of our findings, we believe this mechanism is a major cause of recanalization in this study rather than degradation of the embolic material. n-BCA is believed to be the most durable of the liquid embolic materials. In the experiment by Brothers et al,13 3 of 11 animals (27.3%) showed recanalization after embolization with n-BCA. A prospective randomized clinical trial of n-BCA for human AVM embolization did not assess recanalization18; however, there is a retrospective report of recanalization after n-BCA embolization.19 Gruber et al19 reported 13 recanalizations of 26 lesions and concluded that patients who did not receive total or solid casting with n-BCA had a risk of recanalization after 3 months of embolization. On the other hand, Murayama et al10 experienced no angiographic recanalization after experimental embolization of 26 swine retia with an EVOH/DMSO mixture (Onyx). In this preliminary study, we could not show such durability with the Eudragit mixture. However, because their embolization with Onyx was not limited to the proximal part of retia, it should be a less preferable situation for recanalization. The comparative study between those 2 embolic agents with the exact same embolization technique will be addressed in the future study. We observed variable intensity of inflammation within embolized vessels at both acute and chronic stages. This inflammation was more severe than previously reported for other nonadhesive liquid embolic materials. Because the retia injected with ethanol/iopamidol mixture showed minimal endothelial damage, the inflammation was likely caused by the Eudragit polymer. This is consistent with reports of inflammatory responses to cationic polymers that are also widely used as gene vectors.20,21 Some of this inflammation might be caused by interaction between the positively charged polymer and negatively charged blood cells. An acute inflammatory response with Eudragit was not reported in studies using rat and dog kidneys.5,11,12 Sadato et al11 found acute inflammation in specimens injected with 50% ethanol but not with 10% Eudragit. They speculated that the difference was due to the type of tissue adjacent to the embolized vessel. The vessel injected with ethanol was surrounded by viable tissue, which had the potential to recruit inflammatory cells, whereas the vessels embolized with Eudragit were surrounded by necrotic tissue. Our specimens showed both embolized and intact vessels in close proximity to each other due to the partial embolization, making this theory an attractive explanation for our findings. Inflammatory cell induction, especially neutrophil by the foreign material, generally starts from 30 minutes to 1 hour after its exposure. Acute inflammation may be pronounced by the period between embolization and sacrifice because our subjects in the acute group survived for at least 6 hours. Jahan et al22 reported a mild acute inflammatory reaction with or without angionecrosis in patients in whom they performed AVM resection a day after Onyx embolization, even though their study of embolization in swine did not show such reaction.10,22 The swine in their acute survival group possibly were sacrificed much earlier than ours. Chronic inflammatory reactions that we observed in this study are similar to those of Onyx in both humans and animals. Mild-to-severe degrees of inflammation have been reported in both animals and humans by 2 days after n-BCA embolization.13,19 Angionecrosis and disruption of the internal elastic membrane were observed in these studies. The histologic reaction we observed with the Eudragit mixture is comparable with these reports. In addition, previously reported extravasation of n-BCA in rete was not observed with Eudragit in our study, which may make Eudragit a better embolic agent. We have evaluated a nonadhesive liquid material, Eudragit mixture, for AVM embolization. The handling of this mixture proved relatively easy due to its nonadhesive nature. Although recanalization was observed at 1 month follow-up, no recanalization was seen at 3 months. The overall results of this study suggest that Eudragit polymer mixture offers promise as a liquid embolic agent for the embolotherapy of AVM. We thank Shigeki Kobayashi, director of Chiba Prefectural Emergency Center, for advice on making the Eudragit mixture. We also thank Pauline Chu, Life Science Research Assistant, Department of Comparative Medicine, Stanford University School of Medicine, for her suggestions and preparation of specimens. Finally we are grateful to the Röhm America (Piscataway, NJ) for donating the Eudragit-E 100. This work was supported by the internal gift grant from the Department of Radiology, Stanford University. Paper previously presented at: Joint Annual Meeting of the American Association of Neurological Surgeons/Congress of Neurological Surgeons Cerebrovascular Section and The American Society of Interventional & Therapeutic Neuroradiology, February 1–4, 2005; New Orleans, La. Accepted after revision December 28, 2006.